A mostly dry day with the odd shower, and a strong SW wind gusting to 25mph. It was very apparent the ide were in full spawning mode today, with shoals of fish thrashing in the margins on both waters. A ruling was made on Queensberry Water that the angler on end peg 27 could not cast past peg 28, to allow the ide to Spawn in peace..! Due to the activities of the ide, they were very scarce at the weigh – in today on both waters, but some nice catches were recorded none the less. On Queensberry Water Steve Royle got his tactics right today, opting to fish the pellet waggler on peg 19. A nice run of carp seen him put 60lbs 10oz on the scales, winning his section comfortably, and the overall match. Second place was closely contested by Paul Hodkin, Geoff Whittle and Colin Hart, with Paul Hodkin taking 2nd spot by a mere 4oz. 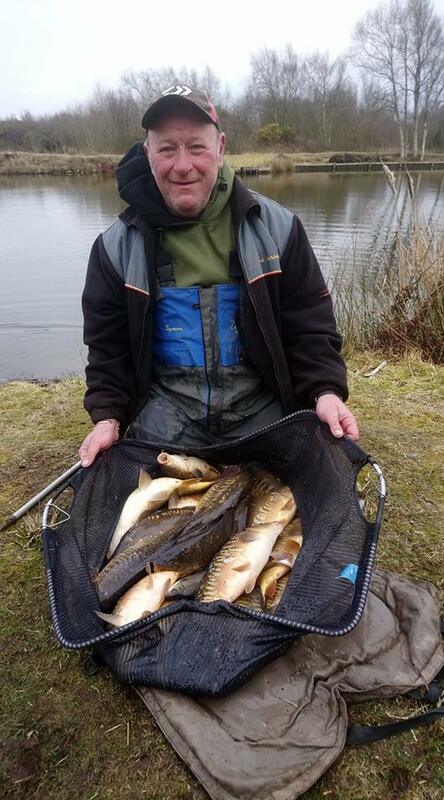 Paul weighed in 39lbs 14oz, a nice mix of carp and skimmers… All caught by casting his feeder over his pole line with the wind too strong to allow him to hold the pole.. A wise move on the day.! On Wallace Lake the ide were also spawning, with very few turning up on the pole lines. Carp were crashing around tight across in the margins so expectations were high. Turns out they were difficult to tempt, we are almost certain they were pre – occupied eating the spawn..,! It was all about trial and error today, with everyone trying different things to put a few fish in the net. Barry Young started on maggots / Groundbait but only one skimmer showed up, however a switch to feeding pellet with worm fished over the top was the game changer, with another 19 skimmers,, 2 carp and 4 ide in the last hour and a half to add to his 6 small carp caught on the method feeder. 41lbs 10oz at the weigh in secured him the lake win. Rosen Arsov stuck it out on the method feeder, netting a few small carp, then switching to his pole line late on to catch 2 more carp and a handful of silvers to weigh in 26lbs 11oz, enough to take 2nd place on the day. I think everyone is now realising the end pegs CAN be beaten on Wallace Lake, with both end pegs failing to produce, and for two consecutive weeks..,!! A hard day for pole fishing with the wind, but credit to all who stuck at it today to grind out a result..! Well done guys.